Last week the Mining Indaba came and went just like it does every year. Some 7,000 people attended. On its margins, outside of the Cape Town International Convention Centre (CTICC), a different kind of mining indaba, a people’s indaba, took place in close by Woodstock. This was the 5th Alternative Mining Indaba (AMI), which serves as a counterpoint to the industry event. AMI voices always struggle to find their way into the CTICC, but the chorus from the margins is growing stronger with each passing year. Nevertheless, a sombre mood hangs over mining. The State of the Nation Address (SONA) added to this dystopia, as President Jacob Zuma’s speech, and whatever little it had to say about mining got swept away by the public distraction over the fracas that ensued at the opening of parliament. The scenes in parliament brought to the fore the slow deterioration of our democracy. Inevitably, these scenes also cast a dark pall over mining’s future. Mining policy remains in limbo, as our government seeks to redefine the role of mining capital and insert a new ownership and beneficiation model over mining. At the Mining Indaba there was much agitation about business confidence. Incongruously, the get-rich-quick mining and extractives lobbyists have turned themselves into latter day development activists promising to be virtuous and help sort out the poverty oozing from every corner of Africa. You wouldn’t guess it from the current living conditions of mineworkers, but if the talk at the Mining Indaba is anything to go by, mining companies also want to build social housing, clean up the environment and sort out the education mess. This is the promise they are making in return for being allowed to dig holes and meet compliance obligations set out by the Mining Charter and Mineral and Petroleum Resources Development Act. The fact that the mining lobby and its coterie of professional consultants now seek to compete with activists, NGOs and community leaders in tackling the scourge of poverty, was the source of much amusement for those attending the AMI. The truth is that more than a hundred years of mining gold and other minerals from the rich seams under South Africa’s soil has led to a distorted development dividend. It’s an appalling indictment of how unequal mining’s provident has been. 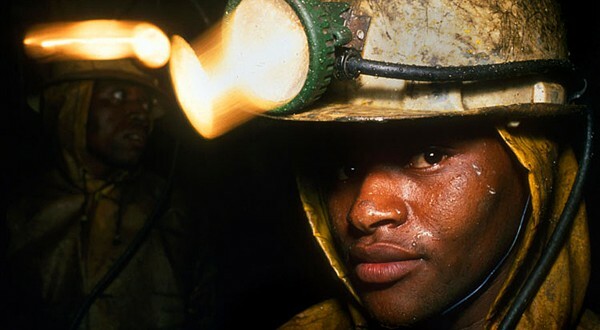 The tragedy of South Africa’s gold mining history was indeed a sore point at the AMI, which examined the impact of mining on workers and mining communities. At the AMI, we learned that mineworkers, who inhale goldmine dust, carry the burden and cost of the silicosis epidemic. This occupational lung disease is a sombre illustration of how mining companies externalise social, economic and health costs. These externalities are not reflected on the balance sheets of mining companies. Poor rural communities throughout Southern Africa carry the burden of these externalised costs, especially the occupational lung disease, silicosis. Perhaps the most tragic part of it all is that these diseases could have been prevented if proper health and safety standards were instituted, such as kitting out mineworkers with proper clothing and taking other preventative measures. All of this happens against the backdrop of the recently released Mbeki report on illicit financial flows from Africa over the last few decades. The report confirms what we know already. There is as much money leaving Africa through tax avoidance and corruption, as the money entering the continent by way of overseas development assistance. The inability to stem these outgoing illicit flows has retarded development in Africa, denying generations of Africans economic opportunities. Notwithstanding this problem and the associated question of governance, a new economic framework is necessary for mining in South Africa. It is not about digging holes, but about building a more resilient and sustainable economy that is less dependent on mining for exports and more about converting minerals into products and services that further integrate mining into the rest of the economy. If this is not the trajectory we embark on in the next decade, mining will become an island economy. Africa’s mining wealth and that of South Africa is vast, but what we must pay attention to is the fact that mineral wealth is a depleting resource. If our mineral resources are used wisely, a lot could be done not only to grow our economies, but also to direct wealth generation away from depleting resources towards the development of other types of non-depleting economic assets. These non-depleting assets should ideally be in the area of human capital, infrastructure development, manufacturing and accumulating savings so as to reduce the need for borrowing. The terrain on governance over mining is constantly shifting in South Africa and is not quite pleasing to international capital that wishes for stability and an exclusive mining economy that harks back to bygone days. Nevertheless, while that era is over, exclusive relations are taking new forms. Within the ruling elite there is much debate about how to change the game. New legislation is meant to modulate the tone and nature of the game as well as the relationship between private capital, the state and empowerment beneficiaries. However, the new dispensation that will follow revisions to current mining legislation evidently is still empowerment-ownership focused with a strong emphasis on beneficiation through discounted domestic pricing for strategic minerals that are relevant for specific types of industrial uses and other areas of the economy. The current empowerment model in the mining sector emphasises an orientation that is corrupted by short-termism. The problem with this empowerment model is that it always rewards only a few players, even if arrangements with mining capital are broad-based. This model remains the prevailing paradigm of mineral wealth control and distribution. In many respects, it gets in the way of creating a fairer dispensation and allowing a more holistic economic model to prevail. There are different empowerment models that can facilitate an alternative result. But these receive little attention or coverage in mining debates. Good economic planning for minerals would be better enabled through a transition model where one doesn’t see minerals ownership and its immediate exploitation as an end in itself, but a stepping-stone towards creating a more resilient and diversified economy. An alternative model could increase the state’s share in mining companies and in this way also enhance capital accumulation for the state. More capital accumulation means the state can do more whilst borrowing less in the long-term. This is the direct approach. An indirect approach is to mine and convert these goods into other types of products and services that have higher value – the beneficiation model. This enables higher levels of income to be earned in the national economy, which in turn means that mining wealth is more likely to be socialised than privatized. All of these possibilities are feasible if there is a more inclusive political economy and more stable governance over the mining sector and extractive industries. The current state of dysfunction is not conducive even for private capital. It certainly isn’t predictable enough for investment decisions and certainty over the flow of proceeds from mining. But there are stumbling blocks, which must be overcome if change is to be introduced. The prevalence of weak governance over mining may be a deliberate attempt at dysfunction, as it allows informal mechanisms and backdoor dealing for securing mining licenses. Weak governance may also reflect the inability of the state to resolve internal conflicts where special interests closely aligned to the ruling party seek to restructure ownership and the right of access to the mineral wealth of the country. The policy machinery of the state is weak, cumbersome and bogged down in bureaucratic red tape. It simply reflects weak capacity. Those who want a better economic dispensation over mining must contemplate whether the current system should be fixed or be replaced by an altogether new paradigm and mining regime. Most agree the current system will not produce a fair dispensation and a new paradigm is necessary. Only time will tell as to which will evolve – reform or radical change.